d) none of the above"
Spinal nerves are mixed nerves containing afferent and efferent neurons of various types. Anatomically, they protrude from the spinal column bilaterally at each vertebral level. They contain both myelinated fibers (e.g., A fibers) and unmyelinated fibers (e.g., C fibers). The answer is (c): both myelinated and unmyelinated. Please note that spinal nerves are NOT located in the spinal cord, despite the fact that neurons in each spinal nerve will either originate or terminate there. A spinal nerve is a peripheral structure. 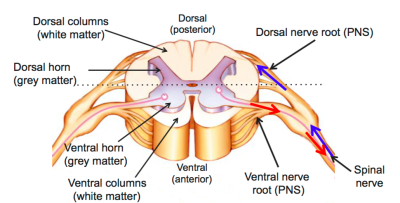 It starts at the point where the dorsal and ventral root converge (See April's Clinical Anatomy, Ch. 1). If you have the opportunity to observe back surgery or dissect a human cadaver, you can see and touch a spinal nerve. They are cable like structures containing bundles of many many many axons, but no neuron in its entirety. A nerve is not a neuron. This is a common misconception. Just to add, the details here may seem like trivia, but they are not. Similar questions (and questions that require you to understand the distinction between a nerve and a neuron) are often asked on US medical licensing exams. This is because they are relevant to understanding and interpreting neurological symptoms and physical exam findings. Primary afferent fibers of the dorsal roots are either myelinated or unmyelinated. In the rat, cat, and monkey, thin unmyelinated and thick myelinated fibers are located in the lateral and medial parts of the dorsal roots, respectively, in the dorsal root entry zone (Light and Perl, 1979a). Not the answer you're looking for? Browse other questions tagged human-biology neuroscience peripheral-nervous-system or ask your own question. 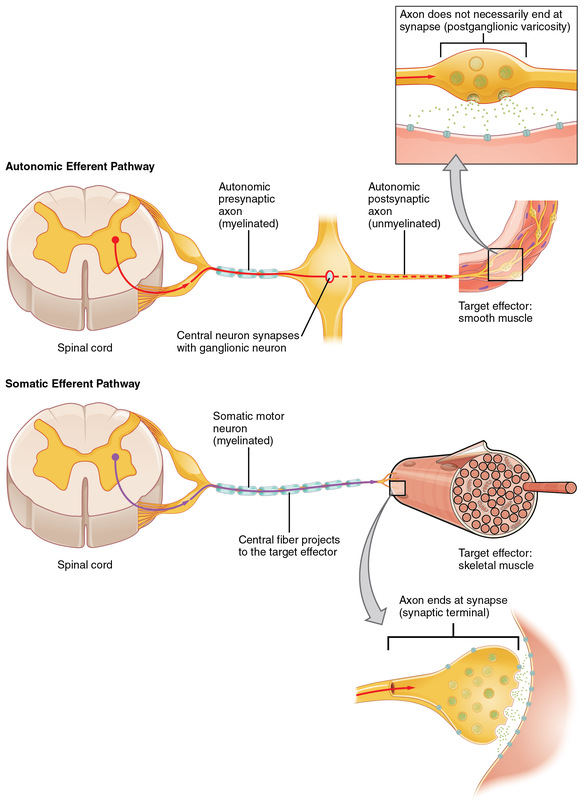 Why are some neurones unmyelinated?